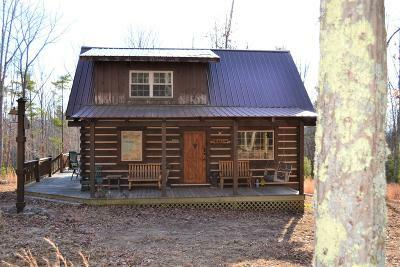 Welcome to HeeHaw Cabin: Absolutely perfect for year round living or one heck of a retreat property! This log & wood home is like BRAND NEW & just full of charm & character! 3BR & 1BA home has main BR on 1st level. Living room with vaulted ceilings, gorgeous exposed beams, old wood mantel & stacked stone hearth, gas log fireplace. Large sun room w/exposed beams for taking in some park like views! The large covered front porch & open side deck are surrounded by nature & make for a great place to enjoy family & friends. Extra storage with a like new 10X12 outbuilding. Small pond, numerous atv trails throughout. Great wildlife/hunting! There's even a small 2 room tiny cabin for that hunting buddy that snores to loud! Easy access with private road to the cabin. This place is a gem! Sun Rm Room Remarks: Could Be A Dr Or Sunroom, Your Choice!